The weather outside is beautiful. Shawn is away. It's pretty easy to shut the doors to these rooms during the day. The garden is more important right now. Tristan and I are reading The Borrowers. Pick an excuse, folks, any excuse. The truth is, sometimes paper piles and laundry just don't make it to the priority list for the week. I sent Shawn a text message one particularly crazy morning asking what in the world God was trying to teach me in it all. I wasn't really asking for an answer but he sent me one anyway (he's a fixer). He basically said, "Loosen up. Stop trying to do it all." So this is me loosening up, whether I want to or not. I'm realizing more and more in these crazy days that it's ok to just let go of the filing and folding and grab onto something that may not be waiting for me tomorrow...like a little boy and a book, or a little girl and her garden gloves, or a sweet bundle of smiling baby. Yesterday I saw the strawberry sign out -ripe for picking! I guess the piles will have to wait another day, maybe more, and I am just fine with that. My newest little nephew, Beau Patrick, was born at home in Chicago this morning. We are so thankful for his safe arrival. Congratulations, Jon, Christie, Lily and Thad! I talked to Yiayia at around 6am (yes, of course Yiayia is there!) and apparently two year old Thaddeus was more interested in getting his oatmeal at that moment than greeting his new sibling. I'm sure that will change. Brothers are way better than oatmeal. Three weeks after our little Kate was born, my dear friend and neighbor, Christy, welcomed her own sweet Kate into the world. No, we didn't plan the name thing -but we think it's pretty cool that it worked out that way. Kate is beautiful and after I took these pictures I realized just how much she resembles her mom. Christy is amazing. She is currently mothering three kids age three and under while her husband is serving in Iraq. She is the kind of friend you call on the phone when you feel like crying because you know you'll hang up laughing. She loves to read and garden (you may have read about our gardening fun and adventures last spring and you should have seen us cramming plants and compost into minivans last week). She knitted that sweet green blanket. She is intelligent and thoughtful and completely unaware of what a ray of sunshine she is to people around her. I don't know what I'd do without your friendship, Christy. I can't wait to see you welcome your Marine home and introduce him to his newest baby girl. That day is so close! Till then, we'll just keep laughing at ourselves over coffee and nursing babes and steal away to the garden center whenever we can. My Sorbet Peony is getting ready to bloom again! I took some pictures of it the other day while lying on my back in the driveway with Kate attached to me in her carrier and Kenna sitting on my knees hollering bounce me mommy! bounce me! (the things I have to do to get a picture these days). I'm pretty sure my neighbor saw me and I'm pretty sure my neighbor thinks I'm weird. Oh, but the result was worth it! Not only did I get a few great shots but I did it with my camera in manual mode for once. All these pictures are straight out of the camera. I've come to the conclusion recently that I'm a lazy photographer. I use my program mode way to much and then complain that the camera is not doing exactly what I want it to do. Um hello, manual mode, where you tell your camera to do exactly what you want it to do. A vessel may be defined as an object that keeps water either in or out; it is the latter sort that concerns us. A small sailing craft is not only beautiful, it is seductive and full of strange promise and the hint of trouble. My sister sent me an amazing cookbook for my birthday. With its wealth of interesting information about food and where it comes from and how to use it, The River Cottage Family Cookbook is so much more than a book of recipes. It is truly a family cookbook and one that will be opened, read, followed and spilled upon many times by our little group. We christened it with olive oil as we tried our first recipe, a basic white bread. I've been in search of a good bread recipe for a while and have yet to find one I really love (or it might be that I have yet to learn how to make really good bread?) This loaf came out alright but since I'm comparing my efforts to the fresh baked heaven that can be purchased down the road at the little Mennonite family bakery well, I'll keep trying. I'm happy to keep watching my kids learning, giggling and licking honey from spoons held in their floured hands, whatever the result may taste like. Shawn may be home but he is very rarely home. He commutes to work over an hour away, taking a dirt forestry road to save a little time. His job is not exactly a 9-5 either, more like 5-9...on a good day. Once a week or so he just stays at work so he can get some sleep. He came home on Saturday morning after two nights away only to get word that this weeks Detachment would be going a day early. He was home less than 24 hours before getting back into his dusty Subaru and taking off for a week out of state. He should have about 24 hours home next weekend before leaving on yet another Det. So what did he do with his precious few hours at home on a beautiful Saturday you ask? He helped me in the garden. I have been frustrated to tears by rabbit destruction, the dog's digging, plants purchased only to be frost bitten the same night not to mention my lack of free hands or time. He knows how I love to be outside, he knows how I love my garden, he knows...but he saw my heart drop every time I stepped out the back door and he came to my rescue. I love this man. I stepped out my back door today and I smiled. Our state flower is the Dogwood. You may have known that but did you know the state beverage is milk? Yep, and the state vegetable is the sweet potato. The state insect is the honey bee. The state rock is granite. We even have a state boat -the Shad boat. I could go on. I had no idea one state had so many symbols. Do you know your state's most interesting symbols? 1. It's free. I have Adobe Elements (not free -not even cheap) but I prefer the basic tools in Picasa. 3. It is perfect for very simple editing when all you want to do is give your photos a quick "clean up", making them blog or print-ready. One click of the "I'm Feeling Lucky" fix and you might be amazed at the photo that was hidden in your photo. 4. It even has fun tools like the "Focal B&W" effect that I used in this post recently and this post a while back. Play with the effects and you'll see - super easy-but people will be impressed and think you have mad skills. 5. 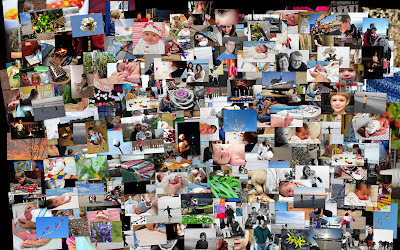 It made that collage out of all the photos I've ever uploaded to this blog. All four hundred and ninety nine. Oh yeah, all there. How cool is that? I'm giving myself away with number four up there but let's be serious, it's hard to find time to use the bathroom most days so do you really think I have time to fuss with complicated photo editing? One day I'd like to claim a few photo shop skills but for now Picasa is my speed and more than enough to keep it fun. Robin has had some really helpful technical tips lately so if you're interested in improving your pictures on the camera end as well, check her out. Then get Picasa and keep it simple. I love to photograph life -wild, moving, laughing, mess-making, growing, changing, refreshing life -and I know I won't catch any of that sitting at my computer. I'm not saying that I have this all together, that I have it made. But I am well on my way, reaching out for Christ, who has so wondrously reached out for me. Friends, don't get me wrong: By no means do I count myself an expert in all of this, but I've got my eye on the goal, where God is beckoning us onward—to Jesus. I'm off and running, and I'm not turning back. We all trekked out to the boat yard last Saturday to spend time with Dad as he worked. The kids made good use of a large mud puddle, a ladder and a lot of rocks. It was a good day. The boat is beginning to shine! The sides cleaned up beautifully white needing only a few coats of wax and those new stripes. There is not much left to do so we hope be lifted back into the water this weekend. I'm really curious to watch the giant lift at work and I'm betting the kids will be impressed as well. Here's hoping for some pretty Easter weather and wishing you a beautiful weekend! One day last week Tristan brought me a math workbook he found tucked in the back of the cabinet. I had purchased the book and then decided it was too advanced for him but when did something being labeled "too advanced" ever stop a kid from trying it? He was determined. I really didn't feel up to the task of patiently explaining math concepts over and over to one child while another was screaming to paint her tummy and another was screaming for mama's milk. I assumed the activity would only yield frustration and failure (and a painted toddler. and a gassy baby.) Honestly, I was thinking a nap sounded like a better idea. Reluctantly, I gave in, spending a minimal amount of time instructing before leaving him to his numbers for what I thought would be a short lived activity. After nearly an hour of contented work at the table with an abacus and a chocolate smencil, Tristan had completed one page of addition problems. They were all correct. Well I'll be. I felt a little guilty about my attitude towards Tristan's desire to learn that day. For some reason, I translated his request as one for structure, planning, teaching...you know, school. In reality, the only thought in his head was, "Hey cool, numbers! Let's do it!" Kenna wanted to paint, Kate wanted to eat, Tristan wanted to do math. Simple as that. It got me thinking a lot about my plans to home school next year. I've been researching a curriculum, talking to home schooling friends, organizing the house, planning what we will read and do and learn, worrying about my ability to teach them. All this fuss -some important, some not so much. What is important is the fact that I have three little natural learners in my house. They are curious and excited about the world around them and don't see learning as a structured process or chore or requirement but simply what they do all the time. My hope is that they will never come to see school as something to just get done so we can go play. My hope is that our play will encourage learning and our learning will be full of play. I have a lot of thoughts about home school swimming around in my head so I'm going to stop before this post gets really out of hand (but be prepared to hear more on this soon when I've organized my brain a bit more). For now, check out that green button over there for the Summer Unschool project. Maybe some of you will want to play along as well. And if you stuck around to read all of this you may have one yourself.